LA JOLLA–T cells are the guardians of our bodies: they constantly search for harmful invaders and diseased cells, ready to swarm and kill off any threats. A better understanding of these watchful sentries could allow scientists to boost the immune response against evasive dangers (e.g., cancer or infections), or to silence it when it mistakenly attacks the body itself (e.g., autoimmune disorders or allergies). 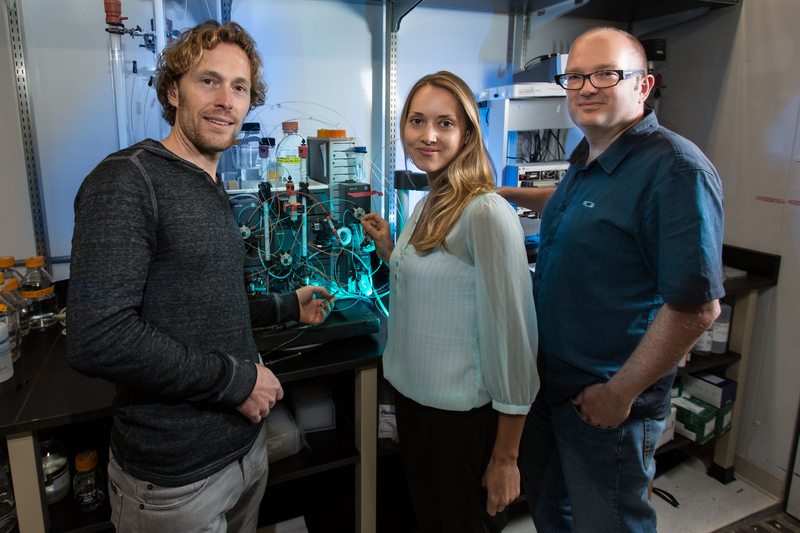 Now, scientists at the Salk Institute have discovered that T cell triggering relies on a dynamic protein network at the cell surface, as reported in August 3, 2015, in Nature Immunology. “This is a completely new principle for how T cell activity is controlled–whether it ignores or responds to a threat,” says senior author Björn Lillemeier, an assistant professor in the Nomis Foundation Laboratories for Immunobiology and Microbial Pathogenesis and the Waitt Advanced Biophotonics Center at the Salk Institute. T cells become active when a signal–often from a virus or bacterium–triggers molecular sensors on their surface, namely T cell receptors. Previously, scientists believed that additional molecules that bind T cell receptors and help it to perceive this signal were like grapes hanging from a vine, occasionally dropping away or joining to begin the process. In contrast, the new discovery shows that T cell receptors are incredibly active–more like a bustling train station, with molecules rapidly coming and going at different intervals of time, says Lillemeier. A protein called ZAP-70 is well known as a crucial player for kicking the T cell into action. Until now, scientists assumed that a silent form of ZAP-70 floats around inside the T cell until a threat is detected, which recruits ZAP-70 to the cell surface and activates it. By analyzing mutant forms of ZAP-70, Lillemeier’s group discovered that instead of ZAP-70 binding the T cell receptor firmly, it comes in contact with the receptor sporadically. Each time this happens, ZAP-70 has to adopt an unfavorable shape that forces it back inside the cell. This cycle continues until a second molecule, called Lck, helps it to remain with the T cell receptor. The prolonged stay at the cell surface activates ZAP-70 and prompts the T cell to attack invaders and diseased cells. Salk scientists have discovered details into how immune cell activity is controlled by a key protein. 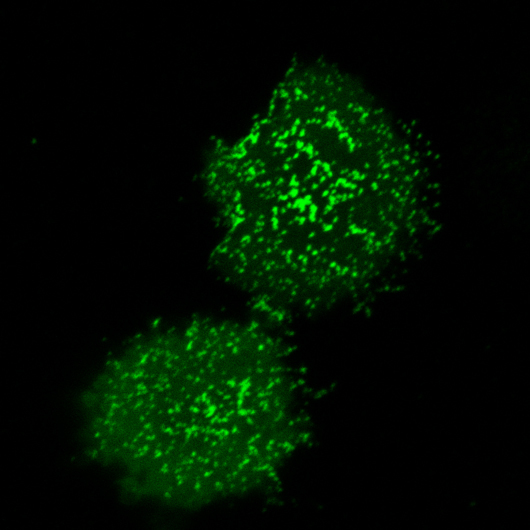 The protein kinase ZAP-70 (green) clusters at the plasma membrane upon T cell activation. Lillemeier’s team is working to identify new principles that determine if T cells respond to a threat versus staying quiet. In addition, they are testing whether their findings could be applied across additional processes in T cells and other immune cells. Because proteins have many of the same modular building blocks, in principle, any protein with structural characteristics comparable to those of ZAP-70 could be controlled by similar mechanisms, Lillemeier says. Other authors on the study were Christian Klamm, Lucie Novotná, Dongyang Li, Miriam Wolf, and Amy Blount of Salk’s Nomis Center for Immunobiology and Microbial Pathogenesis and the Waitt Advanced Biophotonics Center; and Kai Zhang and Jonathan Fitchett of Eli Lilly’s Lilly Biotechnology Center in San Diego. The research was supported by the National Institutes of Health, the Nomis Foundation, the Waitt Foundation and the James B. Pendleton Charitable Trust.